Home / AIE WoW Alliance Guild! No, it is not April 1st! For several years, AIE community members have been asking us if we have an Alliance guild in WoW. The evolution of WoW and gaming in general has made it more interesting than ever to want to see both sides of every story. However, the answer on Alliance has always been no for a number of reasons, though the officer team has continually taken these requests to heart, and has reevaluated the decision often. The recent change to 50 characters per server has allowed us to overcome one of the largest hurdles…space for new officer alts on Earthen Ring. Among the many factors we considered when planning this, we certainly debated what server an Alliance guild should be created on. Taking various factors into account, including consideration for our sister communities such as Convert To Raid, ease of administration, and server populations, our conclusion was that it makes most sense for our Alliance guild to be on Earthen Ring. We are not Horde vs Alliance. We are AIE! Not all officers will be playing Alliance, especially right away, so getting invites may take longer. Please be patient. You can always ask for a WoW Alliance officer in Discord #lfo, which will be a recommended way to catch officers who may be on the other side. We are hoping to limit this to a single guild on the alliance side initially and will be requesting members only add 1 or 2 characters (this could evolve in the future). There will not be immediate access to guild repairs, extended bank services, etc. This may change if we can build up a gold reserve and work out those services. All AIE policies currently in effect for the Horde side and for the Community at large will be in effect for the Alliance side. 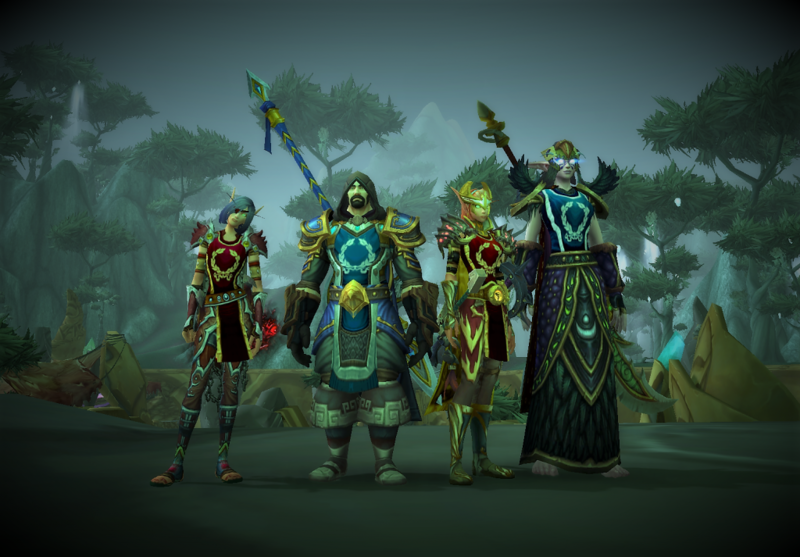 If we do choose to participate in Community PvP, such as COOP, we expect everyone to be respectful to AIE on either side though fun Alliance vs Horde engagement will be part of that. Similarly, those choosing to play via warmode should expect fun engagement with other AIE members. We will all need to have an open mind in these cases and work hard to limit all drama. Warmode means “let’s dance” and who better to dance with than friends! For the Horde… and the Alliance! Over 10 years ago in an alternate universe, AIE was founded, and not being able to pick a faction, the guild chose both. Through a bit of timewalking and a collapse of various quantum entanglements, that reality has merged into ours as of today.